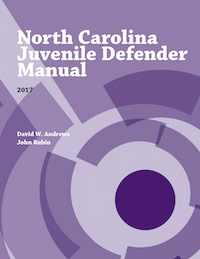 The 2017 edition of the North Carolina Juvenile Defender Manual reviews relevant law and provides practice pointers for attorneys representing juveniles in delinquency proceedings, from intake to disposition. Topics include: petition and summons, custody hearings, probable cause and transfer hearings, discovery, motions to suppress, plea negotiations, adjudicatory hearings, dispositional hearings, probation, commitment, appeals, and expunction. This is the second edition of the manual. It is available for purchase as a soft-bound book here. David W. Andrews is an assistant appellate defender and the Director of Non-Jury Dispositions at the Office of the Appellate Defender in Durham, North Carolina. There, he represents indigent appellants in criminal, juvenile delinquency, and involuntary commitment appeals in the North Carolina Court of Appeals and the Supreme Court of North Carolina. David has worked extensively on cases involving juvenile defendants subject to sentences of life without parole and serves as the liaison between the Office of the Appellate Defender and attorneys who handle juvenile delinquency and involuntary commitment cases. He earned a B.B.A. from the University of Georgia and J.D. from North Carolina Central University. John Rubin joined the School of Government faculty in 1991. He specializes in criminal law and procedure and indigent defense education. Before joining the School, he practiced law for nine years in Washington, D.C., and Los Angeles, California. He has written extensively on criminal law and procedure and teaches and consults with indigent defenders, judges, magistrates, prosecutors, and others who work in the court system. He earned a B.A. from the University of California at Berkeley and a J.D. from UNC-Chapel Hill. In 2008, he received the Albert and Gladys Coates Term Award for Faculty Excellence. In 2012, he was named Albert Coates Professor of Public Law and Government.